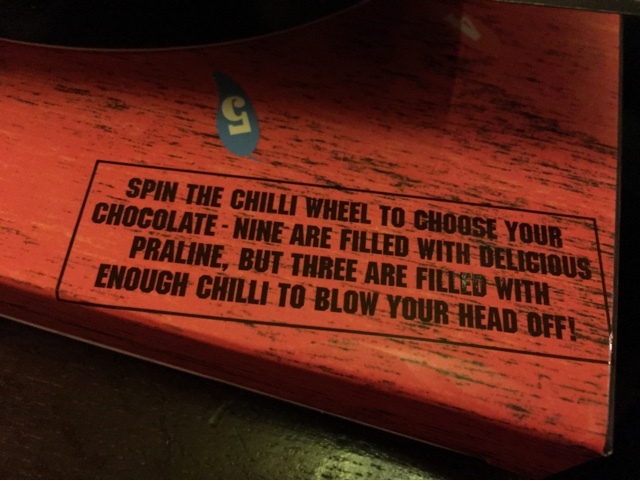 A long time ago we were given this pack which is an edible game of chilli chocolate roulette. The box is very intimidating so we decided that we'd not want to play it without liquid refreshment on hand. We'd also wanted to wait for there to be more than 4 'players' else you'd basically guarantee yourself a chilli chic! Essentially you are supposed to spin the spinner to select a chocolate, but as they all looked identical this was quickly abandoned. We all grabbed a chocolate and took a bite. 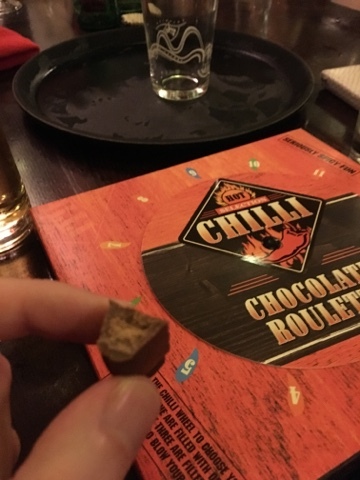 Of the 12 available chocolates three had the chilli in, and 9 were just praline. Unfortunately they were all slightly odd because they were just out of date. I don't think this really changed the experience though because people really only had one. 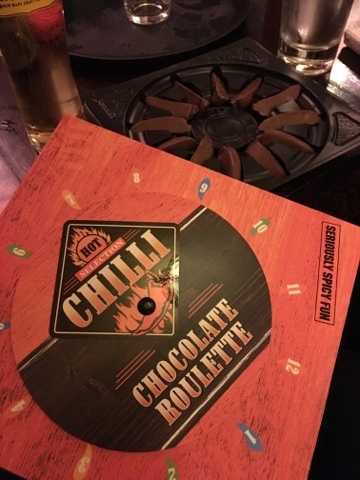 The main issue was that the chilli was no where near the heat of the chilli chocolate that we reviewed in our office by Psycho Chocolate that reminded me that this existed. I tentatively bit into my first chocolate, and had to give it a serious chew before I was completely convinced that it was indeed the booby prize. A small sip of cider was enough to quell the enjoyable heat, and it was generally agreed that the chilli ones were the nicer option. Not quite enough to blow your head off then, but a fun little distraction non the less.